I took a workshop with artist Ellen Anne Eddy years ago. At the beginning of class, she passed out purple hearts (made out of her hand-dyed fabric). She said something to the effect of, "There, you've all earned or will earn a sewing purple heart. Get over it and get to work!" I came across the purple heart late last night after a huge row with Iris earlier that evening. They should give out purple hearts for motherhood. Well, I just took Ellen Anne's and reissued it to myself for motherhood. At the very least, don't you think that our society should give health insurance for people willing to perform the hazardous duty of growing a baby, giving birth and raising a future taxpayer? Apparently, we don't think so. Value of Producing Future Taxpayers. Keep in mind that $200,000 is an average value. Higher-earning parents and parents of children that require above average care & resources lose more. In addition to a purple heart, I would like the same lifetime health coverage given to veterans, a thanks every year, and a check accompanying the thank-you note. Is that too much to ask? Iris said that she caught a violation of the first amendment in her Holt California Social Studies workbook (page 33 of World History, sixth grade). See her take on the issue. She has a long history regarding this issue. Is a ten year old that thinks this way a desirable or undesirable draft pick? Read her father's take On Confederate Flags and the Pledge of Allegiance. Another friend, a high school teacher, told a story about the influence of class rosters on teacher effectiveness. Some (perhaps most) schools deal out students like cards, from the top of the deck to the bottom. It literally is a draft pick with the principal doling out the students. That way, the teachers all get roughly equal numbers of easy and difficult students. One year, my friend's school was surprised by high enrollment figures and needed to hire an extra teacher. The district process took about 5 weeks and the students were told that 5-6 volunteers from each of the other classes would be transferred to the new teacher when he arrived. The students were also told that the volunteers would be given tabula rasa (a blank slate) on grades when they moved to the new class. Not surprisingly, all of the kids that transferred to the new class were the kids that wanted to extend their summer vacation by 5 weeks. ;-) The volunteers in her class stopped doing work and she had no hold over them. She just taught the kids that chose to stay. A few weeks later, the volunteers left. That was her best teaching year ever. Absent the 5-6 discipline problems in every classroom, she could focus more time on lessons. They covered more material and in greater depth than ever before. The kids in the class were more engaged and less inhibited in classroom discussions. It was great all around. It wasn't until the next year, when she was chatting with the other teachers about the past year, that they realized that they had ALL had their best teaching year ever. The rookie teacher hired at the last minute to teach all of the problem students/volunteers? He left the teaching profession after that one year. As my friend told this story, I could tell she was clearly ambivalent about her role in the affair. Should she and the other teachers have noticed and spoke up about the nonrandomness of the assignment process? Should the principal have used a fairer system? We have an expression, "eating our young". I think that the seniority-based system for teachers and the two-tiered wage/benefit structures in other industries are forms of eating our young. Some schools in LAUSD lost more than half their teachers, including many highly effective ones, during recent layoffs. In part 3 of the draft pick series, I will explore why 'fast learners' are no longer grouped together in elementary schools. The LA Times has published two more stories about Value-Added Teaching (VAT). I don't live in LAUSD, but I can't resist a good statistical analysis. The latest story includes a valid point from a critic of VAT. Jesse Rothstein, a professor of economics at UC Berkeley who has been critical of the value-added approach, says the preliminary results didn't answer some of his key concerns, such as how results are affected by the way students are assigned to teachers. If we grade teachers by the VAT methodology, then our children immediately become draft picks. If teachers become coaches with public accountability, then shouldn't they also be able to pick their team players? I spent an hour browsing the teacher comments on the LAT VAT database. They raise some troubling questions. One teacher asked to see the data pertaining to him. He wrote that, according to the LAT database, he was more effective raising the math scores of his students than the writing scores. The data that he has received show the opposite effect. He asked if the database had mixed him up with another teacher or if they were using different years' data. Another teacher said that he was proud to be of average effectiveness given the difficult circumstances of his job. After retiring from the military, he went back to school to become a school teacher. He taught at a very low-performing south LA school nearly entirely composed of poor Latino students. He claimed that the principal assigns him a disproportionate number of disruptive young males because of the perception that he is better equipped to deal with them than the female teachers. The amount of time he can spend on teaching is curtailed by the time he spends on discipline. He works much harder to maintain classroom control than the other teachers. He wants the other teachers to take their fair share of the difficult students. If his pay is reduced and the other teachers with easier class rosters get raises, he will quit the profession. This reminds me of stories from two school teacher friends. One taught English learners at the elementary level. One year, she taught at an urban school with 300% turnover during the school year. How is that possible? She explained that no student from the beginning of the year stayed for the entire year. On average, they stayed only a few months and then followed their migrant farm worker parents. She mentioned how difficult it was to maintain classroom control. At that time, there was a much publicized study showing how teachers focused ~80% of their time on the boys and only 20% of their time on the girls. She said that, if someone put a camera in her classroom, they would find her near average in that respect. There were a handful of boys that were a total drain on her time, energy and a real drag on the rest of the classroom. They would climb anything if you turned around for a minute. Years later, I read studies linking prenatal exposure to organophosphates (insecticides) to ADHD, particularly in boys. I wondered if the boys in her classroom were exposed in utero through their farmworker parents. Should teachers be financially penalized or rewarded for difficult assignments? As a parent, do you want your child to be in a classroom with kids with severe ADHD, suffering from PTSD or carry weapons to school? Lots of questions, no easy answers. To a large extent, parents have been voting with their feet. We have seen an exodus from troubled schools/neighborhoods that has bid up the housing prices of areas that enjoy above average schools and safety and below average chemical residues. But what do we owe the children left behind? Or the teachers willing to serve those areas? but the views, food and company were excellent. Thank-you Fiber Musings and SYC! Some of the wildlife we encountered. 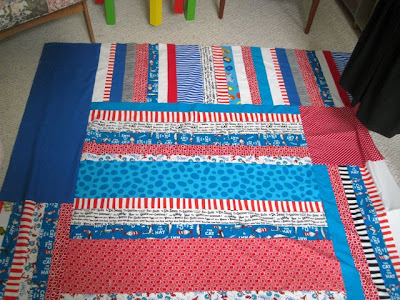 I mentioned this quilt in the seven minute quilt top post. 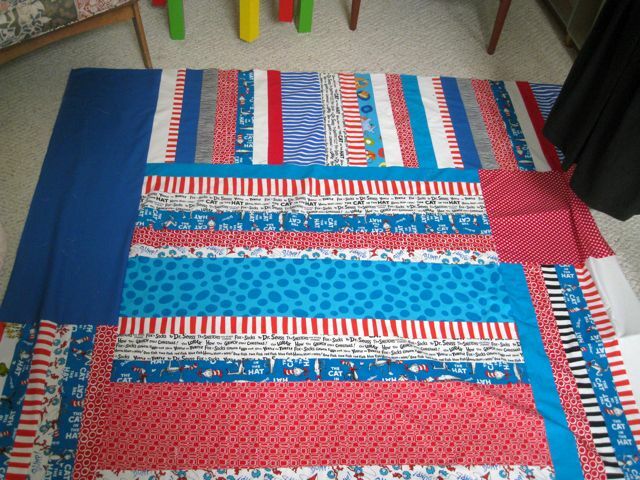 Our quilt guild also makes quilts for children in the LA county foster care system. Many of these kids were removed from neglectful or dangerous homes. They don't have many things that are theirs alone. We endeavor to give the kids a book and a quilt that matches the theme of the book. Can you guess which book I bought to go with this quilt? 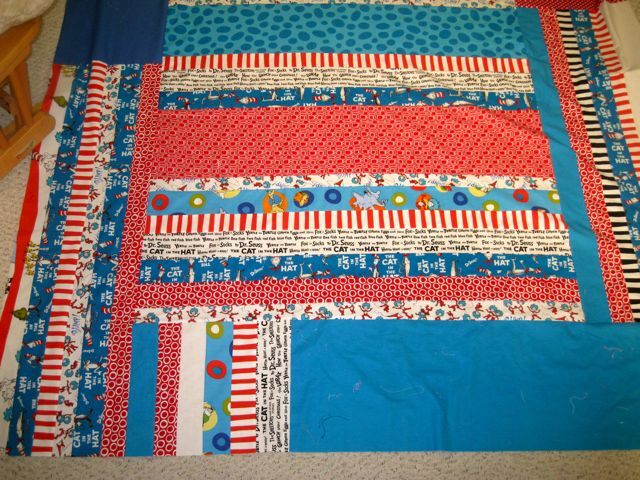 I received a bundle (one of about 10 given to our guild) of Dr Suess-themed fabric from the line put out by Robert Kaufman. They were scraps from their cutting room. 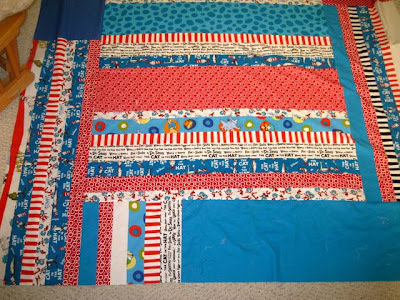 Once I started assembling the strips, I realized that there was nearly enough to make a twin-sized quilt. I went through my quilting cotton collection and pulled some candidates. I added borders around each edge. until it was large enough. 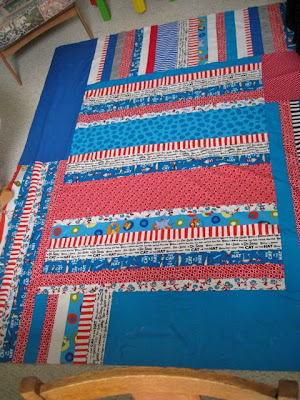 Then I ran out of time and passed the quilt top and some backing material from my fabric collection to our guild's "Read me a quilt" coordinator. She will finish it and present it to a child at this weekend's party for LA county foster children. Many quilt guilds throughout the region work on this project, so each child gets something special made just for them. If you would like to help give time or materials for our community services quilts, contact me. This year, I kept track of fabric in and out of my collection. I thought I was showing restraint and selectivity. I used 80, gave away 25, but my collection still grew by 20 yards. How is that possible?